Rosanne Greco is a former South Burlington city councilor and a retired Air Force colonel. Greco said there are a lot of reasons she’s not a fan of the F-35s. “Health impacts, property value impacts, not to mention the bombardment of this noise on our children,” she said. But it could be crucial for the Air Guard that the jets arrive next year. 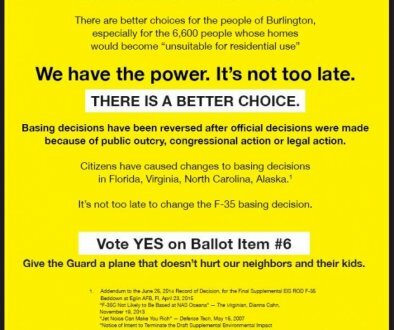 Col. Hank Harder of the 158th Fighter Wing spoke to the Burlington City Council during their last meeting, saying, “… there is no alternative mission for the Vermont Air National Guard. But Greco says that’s not true. “There are direct contradictions between what the Vermont Air National Guard senior leaders are saying — which is, if we don’t get the F-35s, we’re out of business. We have no mission, no job — and what the United States Air Force has said in their Environmental Impact Statement as well as in court,” she said. Greco cites documents from the United States Air Force that she says contradict what the Guard says about the need for the F-35’s.